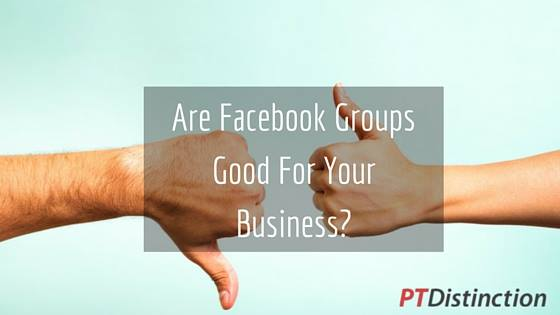 PT Distinction | Are Facebook Groups Good For Your Online Training Business? Is it essential to have a Facebook Group? Or is it just another tool for marketing that will lose its appeal? There are several reasons why a Facebook Group can be amazing for your business. On the flip side, there are many that set up Facebook Groups only to have no one join and say they are useless. So why are Facebook Groups successful for some and not others? One of the best parts of having a Facebook group for your clients or prospective clients is to keep them accountable. If people are being held accountable they will get results. Having a daily/weekly check in works really well and gives your clients purpose. You can then follow up with the people that have posted their goal or target to see how they get on. This builds a relationship and following up means you care about them hitting their target. This is not an insult it’s a fact. If you don’t keep your group entertained or give them value they will soon go somewhere else. It takes time to build up trust online; face-to-face it is easier and quicker. You have to work harder online. You need to be consistent, not in fits and starts. The other end of it is you have to make sure you don’t post too much too. You don’t want people getting annoyed and turning your notifications off or even worse, leaving the group. It’s important to set boundaries and a routine from the start. If you answer questions within minutes and are constantly available. People will start to expect it. So have a set time for check-ins and follow ups. Have set times where you go in to answer questions and put this information in the description. Times have changed. With the internet and the ability to train your clients online and we have access to people all over the world. Having a Facebook Group for your business will allow people from any location with an interest in what you have, to communicate. You can take advantage of that and build relationships whilst giving value. Being an expert in your niche will mean that other people will direct friends and colleagues to your Facebook Group when they need help. Whereas with a Facebook page only a small amount of people see your posts, in the Group everyone that has joined can see your posts. As your Facebook Group starts to grow and even when you first set up, it takes a lot of time to build consistency. Things like welcoming new members, asking questions to increase engagement and answering questions all take time. There are ways to reduce the time kill but it will still take up a lot of your time and attention. As above we have suggested having set times where you check in to answer questions and have set times to check in and follow up. Why does this reduce time? You have heard of batch cooking right? It’s similar to that, when you do a task in batches it means you are in the right mindset for that task and get more done. If you go into your group every time you get a notification (which you should turn off) or keep popping in you will get distracted and end up being in their longer than you need to be. There are social media tools you can use to be more productive and ensure you group is consistently engaged. I can recommend Buffer for its easy to use dashboard and very reasonable price tag. Buffer allows you to schedule posts to be published in your Facebook Group when it suits you. You can do a week’s worth of content each Sunday and just check in once a day. The main reason Facebook Groups have been so successful is its somewhere support can be offered. Whether that is from you the business owner or other people with a common interest it means people have somewhere to go. Having one place to go where you can get your questions answered from someone you trust is priceless. People like to help others; Facebook Groups have been a great source of information for Personal Trainers themselves. There are several groups you can ask questions in and get an amazing answer from someone that has been where you are now. You have heard the saying “You give someone an inch, they take a mile’? So you set up a Facebook Group to give others help and advice, then people might come to expect it all the time. You might get PMs from people that want extra help. You might have people complain that they haven’t received an immediate answer. This can happen in any business, people have different expectations. So it’s up to you to manage them. By being clear with the boundaries of the group and setting a routine early on it will reduce the amount of people wanting special 1:1 time and expecting an answer straight away. If someone does PM you, you can suggest they post it in the group so everyone can get benefit from your answer to the question. Or you can inform them that you are happy to work with them 1:1 but this would involve a cost. Having clear rules and reminding members of the rules will help and having a few long-term members, as admins will help too. Not all Personal Trainers offer additional support. We know that when a client is with us they are focused and motivated. When they are not with us it is important for them to feel supported. Having a Facebook Group allows your clients and/or prospective clients to connect with each other too. Offering additional value will always wow your clients. This could be in the form of a Live Facebook workout, a Q&A session or even providing them with recipes to try. When we deliver to our clients over their expectations they notice it and they tell their friends. That might sound series but if you open up a Facebook Group you have some duty of care to the members in it. We have all heard the term ‘trolling’ so we want to ensure that the Facebook Group we provide is a safe and friendly environment. If the clients are divulging personal information it is important to keep the group closed to protect them. Also, there needs to be clear rules so that people know what the group is all about and what to expect. Having a few admins that you know and trust will help, as you cannot always be online. So as you can see there are several positives to having your own Facebook Group. It is a great way to grow your business and serve your clients. There is a downside that it takes hard work and consistency. We all know growing a business takes time and energy. It really depends on what you want to do and how you feel about it. If you do decide to set up a Facebook Group you now know what to expect. If you don’t you can use other people’s groups where your ideal client will be and offer value……. As I mentioned earlier we will be putting together a guide on how to do this the right way very soon. All in all, it really comes down to whether you want to concentrate your efforts in a Facebook Group or elsewhere for example Email Marketing; we will be covering this in our next blog! We never know what Facebook is going to do next so it would be important to have other ways of getting clients and not rely on one form of marketing.